Recent events in the Middle East and North Africa have highlighted the potential use of online social networks for activism, but they have also added weight to existing personal and security concerns. In a recent interview with Radio Free Europe, for example, Evgeny Morozov even argues that internal security agencies might actually welcome the use of Facebook precisely because whole networks can be revealed and monitored. It's also an issue of increasing concern given the gradual use Facebook to encourage and maintain contacts between Armenia and Azerbaijan in the absence of traditional forms of communication blocked off as a result of the still unresolved conflict over the disputed territory of Nagorno Karabakh. 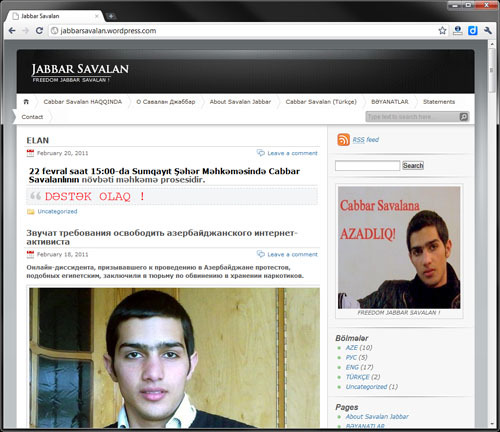 Indeed, fears of the Internet among the authorities in Baku have been growing in recent years, with two video blogging youth activists, Adnan Hajizade and Emin Milli, detained in July 2009 and imprisoned until November last year when international pressure led to their early conditional release. Few buy the government line that they were jailed for ‘hooliganism,’ of course, instead considering the action against them intended to prevent and frustrate their online activism. Amnesty International, for example, declared the two men to be prisoners of conscience and the government remains on edge about the potential for social media to foment unrest after uprisings in the Middle East and North Africa. A few days later, on 9 February, another Popular Front activist, Elchin Hasanov, was also reportedly summoned to police and instructed to remove messages on his Facebook page calling for action in Savalan's support. It is no secret that a number of social networks, in particular “Facebook”, act as the force behind the processes taking place in the world today. “Facebook”, which has turned into an everyday necessity for millions, knows no borders in certain aspects. To the degree that representatives of two enemy nations and countries become friends on the site, in spite of everything. 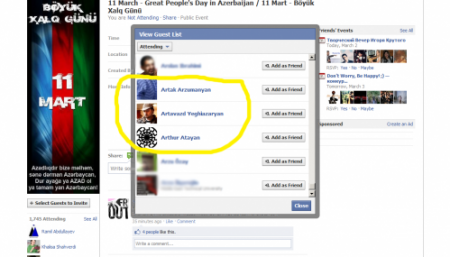 Qaynar.info has tried to find famous Azeris with Armenian friends on Facebook. 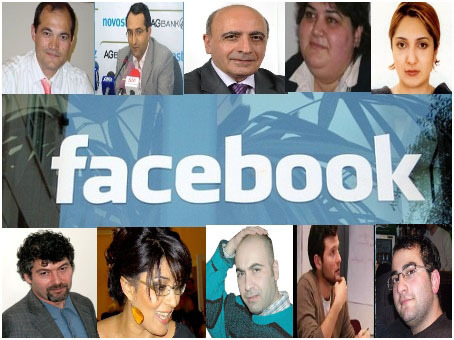 Though many of them make their friends list private, after a brief investigation it has become clear that tens of well-known Azeris are virtual friends with famous Armenian users. Ironically, both Hovsepyan and Vanyan's reputation as two of arguably only a handful of genuine promoters of peace and tolerance in terms of relations with Azerbaijan isn't mentioned in the article, with the latter also a victim of a recent Facebook smear campaign by nationalists in Armenia. why are these people alive? why don’t they go dig their own graves? i used to love that political scientist… i don’t know the rest of them. why do they keep such people at work? let them go work in armenia. i have no words… they call them legal advocates? if any of them fought with these bastards for Karabakh, we wouldn’t be having this discussion. we used to respect many of these people…. shame on you for writing such articles. it’s really shameful. laughable. you just show how low and backwards you are with such articles. may god protect us from “patriots” like you. just try to do what Adnan Hajizada has done for this country, then maybe you can discuss the armenians on his friends list. you are not doing anything for your country with this “patriotism”. so apparently the country has no problems other than this? or you don’t have the courage to talk about the real problems? The damage, of course, might already have been done even if there has been no other action taken to date. Nevertheless, the apparent intention to discredit them in the eyes of the public remains and was also used against opposition candidates ahead of parliamentary elections held in Azerbaijan last November. Now, on a blog by an activist from the pro-government Ireli Public Union, such tactics continue. In a post entitled “The real face of 11 March” the appearance of 6 Armenian names among 1,745 members ahead of actions planned are highlighted — literally. Onnik Krikorian is the Caucasus regional editor for Global Voices Online. An earlier shorter version of this post appeared on the Peace & Collaborative Development Network.